This film, the second silent movie adaptation of Anthony Hope’s best-selling 1894 novel, features craggy-faced Lewis Stone in the dual parts of Rudolf Rassendyll and King Rudolf, and Ramon Novarro, in his breakout rôle, as the villain Rupert of Hentzau. 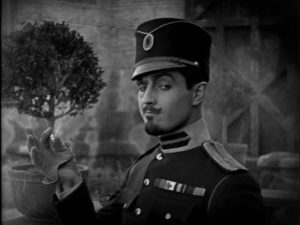 Every version of Zenda is stolen by the engaging rogue Rupert, and this is no exception—and Novarro’s raffish charm in the part made him a star. The movie starts slow, and its talky set pieces betray the production’s origins as a stage play, but the emphasis on interiors and close-ups gives plenty of scope for mugging by an array of fine silent-screen character actors. A great deal of effort was put into Ruritanian pomp and display that hasn’t aged well, and the story doesn’t really pick up until over an hour into it—but once the action starts, there’s actually more swordplay than in the better-known 1937 and 1952 versions. The last forty minutes definitely redeem the previous seventy, and the fencing in the final scenes is better than anything we’ve seen previously in the silent era. Visual Bonus: monocles and jodhpurs!